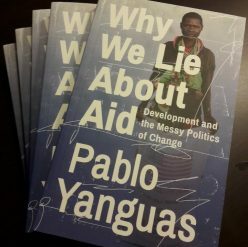 I hoped that some people back there would find the book interesting, a new tool in their ongoing struggle to improve Spain’s aid system. So I decided to send a few copies to the old country, including to Gonzalo Fanjul, one of the most passionate and articulate Spanish voices on humanitarianism and aid. Yesterday he published a post/review of the book in his 3500 Millones blog for major left-of-centre newspaper El País, under the apt title “Orphan aid“. Now that we may be facing new elections, it is in Spain’s interest but also its moral duty to have this conversation, and this book may help launch it. Next Next post: Is there a better response to our public support crisis?